Stroud Township was founded as part of Northampton County on January 22, 1817. That was the 41st year after the United States of America declared its independence from the United Kingdom of Great Britain on July 4, 1776. The president at that time was James Madison, but James Monroe took office on March 4, 1817. Monroe County was established almost 60 years later, carved out of Northampton and Pike counties on April 1, 1836. Stroud Township Bicentennial Historical Association, a non-profit organization, has been formed to make plans to celebrate our 200th Anniversary. 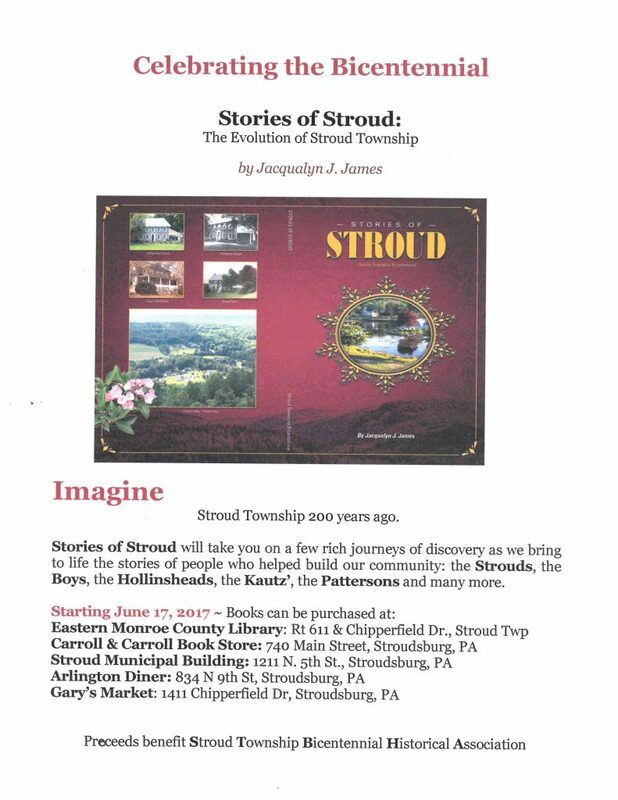 Our mission: To celebrate the Bicentennial of the founding of Stroud Township with the purpose of enhancing public awareness of our heritage and promoting connectedness to our home. • To understand a person you need to know his memories. • To understand a country, you need to know its history. • To understand our community, we need to know how it began and how our township has evolved. Where did we come from? Why have we made Stroud Township home? We will be exploring these questions as well as learning about the people and events that came before us. had fifteen stars and fifteen strips. This 15 star, 15 stripe Flag was authorized by the Flag Act of January 13, 1794, and became the Official United States Flag on May 1st, 1795. Two stripes and two Stars were added for the admission of Vermont (the 14th State on March 4th, 1791) and Kentuckey (the 15th State on June 1st, 1792) and was to last for 23 years, until April 12th, 1818. 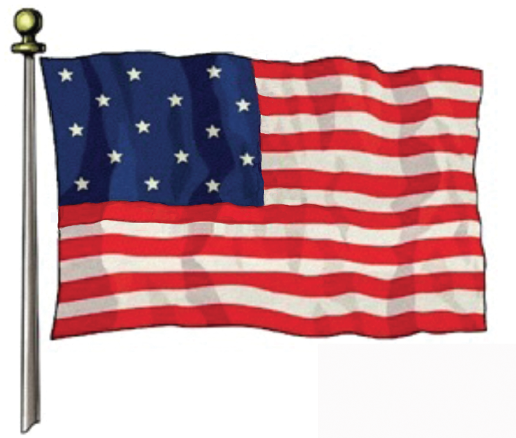 This flag is the only U.S. Flag to have more than 13 stripes. The five Presidents who served under this flag were; George Washington (1789-1797), John Adams (1797 – 1801), Thomas Jefferson (1801 – 1809), James Madison (1809-1817), and James Monroe (1817 – 1825).